Yesterday was an excellent day and a very welcome break from preparing for my move. First up, I went to Longmont and hung out with my friend, Donna Druchunas. I always like spending time with her and conversations are often about knitting throughout the world, which I enjoy immensely. I was pleased to hear that she'll be coming to Alberta next June so I'll see her again then. 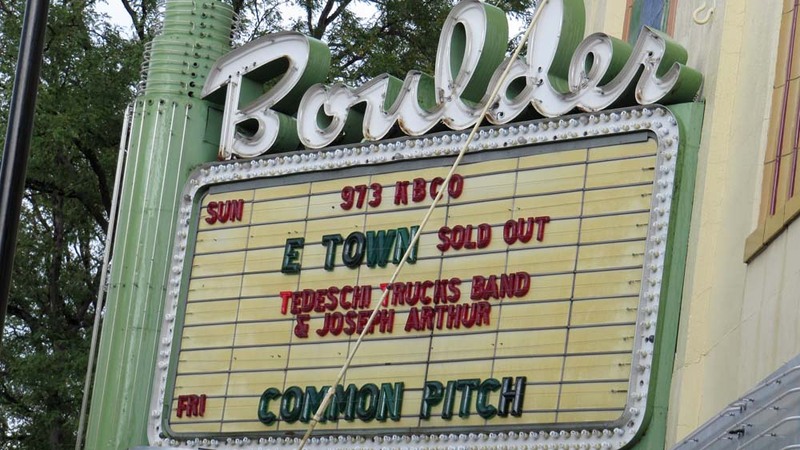 Later in the day, I headed to Boulder to see the Tedeschi Trucks Band. You can click on any of the photos to enlarge them. Use your Back button to return here. 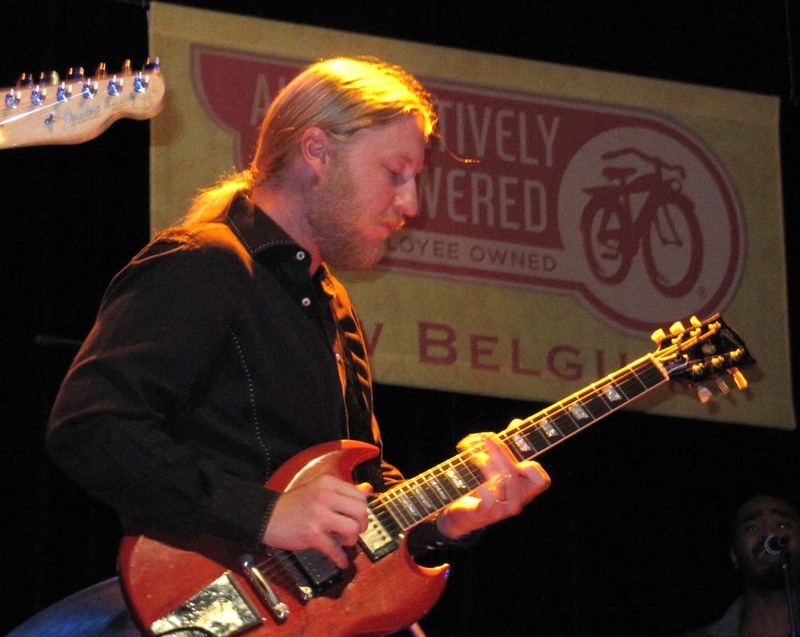 Derek Trucks is one of my all-time favorites guitarists. In a word, he is amazing. He was a child prodigy that sat in with the Allman Brothers, and other famous artists when he was 11 (his uncle is the Allmans' drummer, Butch Trucks) and was playing professionally with his own band in his early teens. If you click here you can hear him at 14. Now that he is all grown up (age 32) he is one of two lead guitarists for the Allman Brothers Band and heads his own group, The Derek Trucks Band. I like the music from both of these groups a lot - the songs, the slide guitar, Gregg Allman's gritty voice. 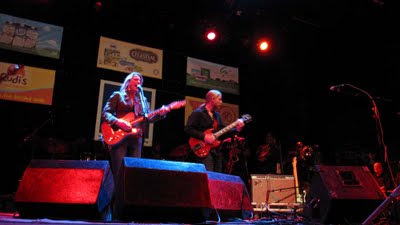 However, I don't particularly like the current group, the Tedeschi Trucks Band. I'm rarely a fan of female singers (Gladys Knight is one exception that comes to mind immediately), and I don't like country music. This band doesn't play country, but Susan Tedeschi's voice has that country sound to it. It's just my own personal preference. I do admire the fact that these performers, husband and wife, are touring and performing together, often with their kids in tow, putting family first. Having said that, I could not pass up the opportunity to hear Derek in person, no matter what band he is in. There were a number of guitar solos and I was in awe of the fact that I was in the front row, 30 feet away, watching him play. I didn't want the experience to end. Photos weren't allowed but, I'm sorry, I was not going to pass up the opportunity to take his photo after waiting so long to hear him. I had hoped to get an autograph, but that didn't happen. 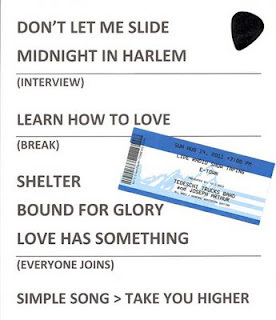 I did, however, get a guitar pick!! I was also handed a paper that was on the stage for the musicians with the band's set list. 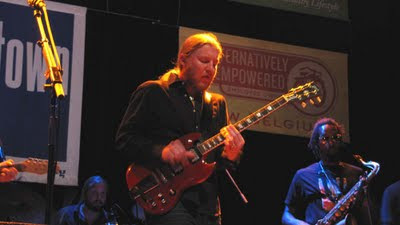 In the Tedeschi-Trucks 11-piece band was bassist for the Allmans, Oteil Burbridge, another fantastic talent. He had a few minutes to shine on his own. 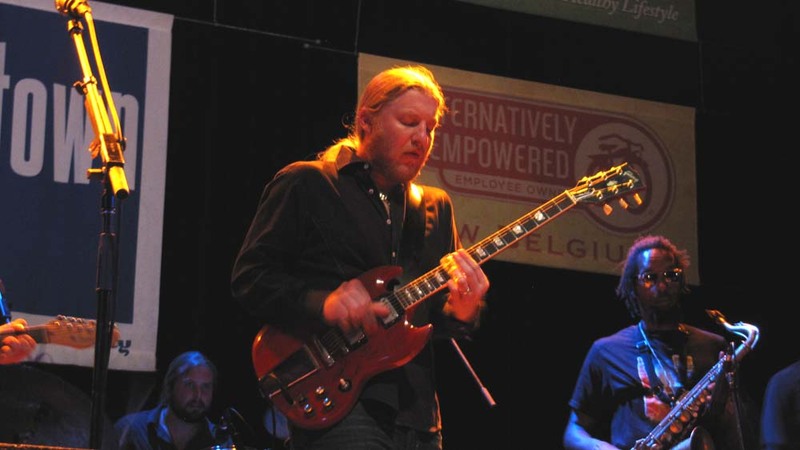 Way in the back, almost out of sight, was Derek Trucks' Band singer Mike Mattison, I wish he'd been able to come up to the microphone and belt out a couple of songs, but it was not to be. Okay, enough gushing and time to get back to the reality of moving!